No matter what the purpose of a portrait may be, it is meant to create a lasting legacy of the subject, as well as a valued work of art. Whether it will be placed in a family home or a corporate or government setting, a portrait can be painted in a variety of styles and moods. The subject may want to be portrayed as warm, approachable, dignified, powerful, or indeed all of these characteristics at once. The initial consultation will be to discover how the subject wishes to be portrayed, and to explore different possibilities for poses, clothing, mood and location. Family members are welcome to be included in this decision-making stage if they wish, and it is often helpful for the subject to bring photos of themselves in which they are pleased with how they are represented. The artist and subject are collaborators in the creation of a great portrait; therefore all input is welcome during the consultation process. Following the introductory consultation, a sitting of 2 to 3 hours will be scheduled in which photographs of the subject will be taken and drawings may be made. A variety of poses, moods and clothing can be explored to best exemplify the purpose of the portrait, taking into consideration any input from the sitter and their family. Following the sitting, the artist will make a selection of the finest images for review. Marina Sexton with her portrait at opening of The Sensuality of the Maturing Woman Exhibition, Christina Parker Gallery, St. John's, NL. The importance of this first sitting can't be stressed enough. For me as a portrait artist, this offers an opportunity to truly get to know my subject. In order to get to the essence of the person I am to paint and to imbue their portrait with this distinctive quality of who they are, their 'spirit' as it were, this unhurried, relaxed time together is of utmost importance. My aim is not only to have the portrait be an exact likeness of the subject, but also reflect their essential selves in the most positive light. A second meeting of 30-60 minutes will allow us to review a selection of images made during the first sitting. All input from the subject and their family is welcome during this meeting. Very often in the first review there will be an image that captures the attention of the sitter on which the final portrait can be based. If the sitter feels there is not a satisfactory photograph from this group of images, a second sitting can be scheduled, followed by a second review. The first sitting almost always produces at least one strong image, but the sitter should be aware of the possibility of a second sitting in case for any reason it is required. 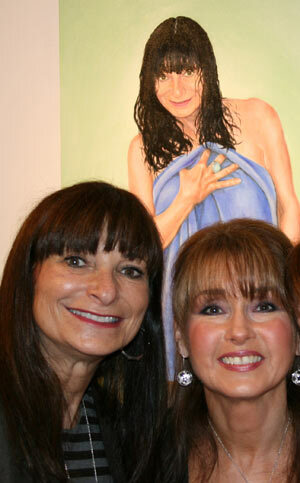 Tina Dolter with Jeanne Beker (her portrait in background) at The Sensuality of the Maturing Woman exhibition, Propeller Gallery, Toronto, ON. 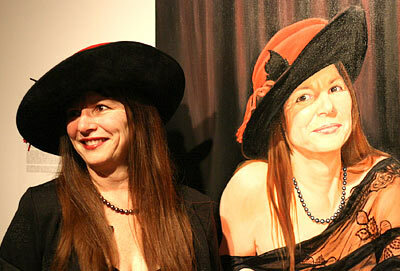 Once the pose is chosen, the artist will return to the studio to paint the portrait. This process can take anywhere from 6-12 months, depending on the size and complexity of the painting. Once the painting is finished, it will be presented for final approval to the subject and their family, and in the event that the portrait is of a professional nature, this presentation should occur before any official unveiling is scheduled. As stated above, I as Artist guarantee an exact likeness of the subject. Only the highest grade professional materials are used in the creation of the painting, thus ensuring the durability and permanence of this work of art.